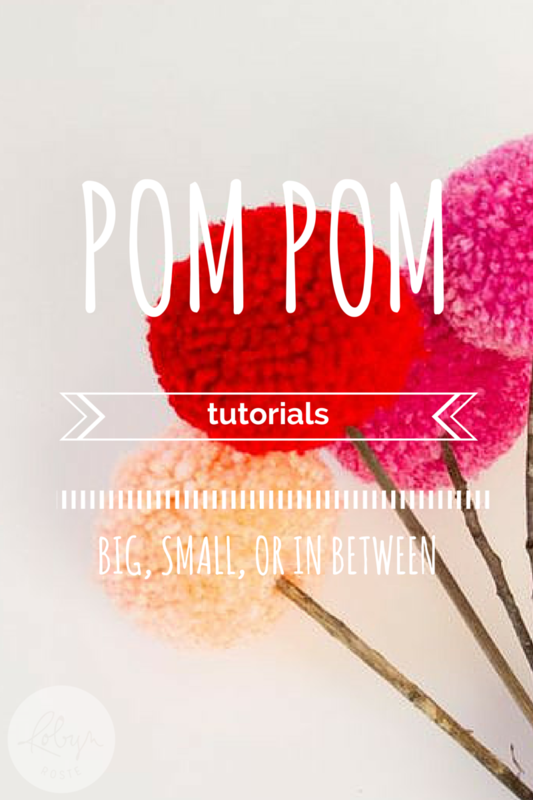 Foolproof Pom Pom Tutorials - Creativity Strikes! There’s something about pom poms I’ve never quite got it. In theory I get it. In theory. But in practice…well my gut tells me I’m too sloppy. In theory you wind yarn, a bunch of yarn, around an object like a 2″ circle or rectangle. Then, in theory, you cut the outside of the wound yarn…tie a string to secure the bits, fluff it up a bit and blamo! Pom pom. In practice I suffer from the tendency to rush. I don’t use enough yarn and spread the yarn bits around as I cut. Making it difficult to tie a string around the, you know, bits. The good news is I’ve scoured the Internet and found three foolproof pom pom tutorials (technically four) for people like me. People who need help making pom poms. This is a two-in-one post but I wanted to highlight the classic fork pom pom. Full disclosure I’ve never heard of this method. Anyway, Handimania took the time to photograph all the steps involved with this version of the pom pom. Use this method if you’re making teeny tiny cute little bobbles. The tutorial is straightforward (as in no words, just photos) and I like how you tie the string around the yarn before cutting the bits. Seems like an important step. For your large pom pom needs there’s an awesome tutorial by Vintage Revivals using, of all things, an embroidery hoop. This comprehensive tutorial also promotes affixing the string before cutting the yarn. So it has my vote! After the pom pom part the tutorial launches into a pom pom blanket. It didn’t hold my interest but if you love massive pom pom blankets, this is for you! I like this tutorial because it’s at my level. The quick-and-dirty, get ‘er done way. But I have to say the main reason I chose this tutorial by Make it Handmade is the CUTEST baby hat I’ve ever seen. You must go see it. Also in this tutorial’s favour is, of course, tie before cut. And she even has some tips for baby-proofing the pom pom so the wee ones can’t pull the bits out (you know they want to). Hope this helps! I’m eager to get going on my pom poms of all sizes. But not shapes. Because they should all be circles.